How do I use the activation code? Choose the option "Activation Code"
Choose the first option, “Activation Code”, and press next if you would like to unlock the software directly from the application, through your Internet connection. This is the easiest option but it requires that GrandVJ can communicate with our servers and is not blocked by a firewall or network policy restrictions. Type your Activation Code first, each group of letters in its own text field. If you have a software box, the Activation Code is printed on a sticker that is attached to the installation CD sleeve. 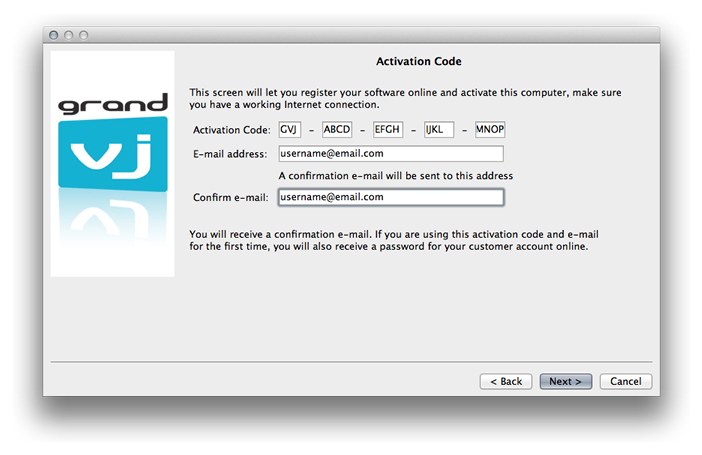 If you have purchased a license online, the Activation Code appears on the “My Licenses” page on the ArKaos web site, it was also sent to your e-mail address. The Activation Code starts with one group of three letters, followed by four groups of four capital letters, each group being separated by hyphens, so a total of 19 letters / 23 characters. There are no numbers. GrandVJ licenses start with GVJ, GrandVJ XT licenses start with GVX and Activation Codes for upgrades start with GVU. In the next text fields you need to specify a valid e-mail address for your online customer account. Case 1: If you don’t have a customer account yet, we will create a new one for you; your e-mail address will be your login and you will receive a password by e-mail. Your software license will be bound to that new customer account. Case 2: If you already have an ArKaos customer account and you want to add a new software license, just use your registered e-mail address, the new GrandVJ license will be added to your customer account with any other existing software license. Case 3: If you already have an ArKaos customer account with a GrandVJ license registered and you want to activate a second computer with that license, just use your registered e-mail address and your existing GrandVJ Activation code. If the registration is successful, it will display a confirmation message and your software will be activated automatically. Once your software license is registered into your online customer account, you can go there change your password, update your customer profile and of course retrieve your Serial Key, generate a new Serial Key or upgrade your license whenever we release a new version.